It’s time to start thinking about your flower gardens! When the temperatures start to warm up, the first thing that I do is think about gardening – what I’m going to plant and where. I thought this year that I would section my flower gardens to make them more appealing. And to do that, I need to think about a garden fence. So, I started looking for some great DIY decorative garden fences that are easy to make and of course, cheap. I found 15 amazing ideas that you can incorporate into your landscaping this year. From bricks to ropes and even a few reclaimed items, there are some great ideas in here for creating a fenced in flower garden. You can even use some of these ideas to surround your vegetable garden and keep out the deer and other wildlife. All of these are pretty simple to build and they all have such an amazing decorative quality. If you are looking to increase your curb appeal, a flower garden fence will definitely do that. You should also check out these 30 eye popping fence decorating ideas for your backyard fence. Whether you just have a small flower bed around your porch or you have a dedicated space where you plant loads of things in the spring, these DIY garden fences are definitely going to come in handy to keep critters off of your plants and to bring a bit of beauty to your outdoor living spaces. They’re all so gorgeous and easy to build that you may just have trouble deciding which one you want! And, be sure that you take a look at these 15 DIY small yard decorating ideas to make the most of those outdoor spaces. Flower beds look so much more attractive when they have a little fence or edging around them. This DIY brick edging is so easy to do and it’s really cheap if you happen to have a few bricks on hand that you can use. This also helps you to blend your flower bed with your walkway and it won’t take you long at all to finish, depending of course on how big your flower bed is. There are some really creative ways to reuse old bricks! 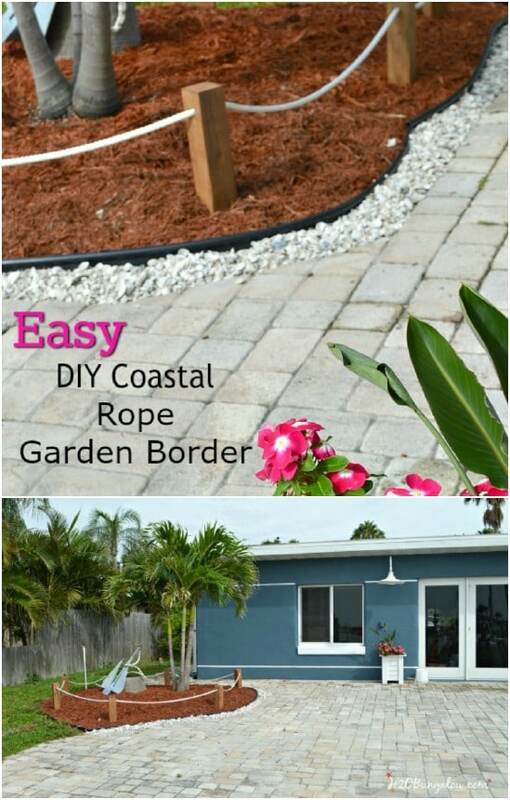 Whether you are looking for a nice coastal look for your outdoors or you just want a garden fence that is really cheap and easy, this DIY coastal rope fence is a great choice. You make this with wooden posts and rope and it’s really simple to put together. You can add seashells to your garden or any number of other coastal themed décor to give yourself a great beachy outdoor look and feel. 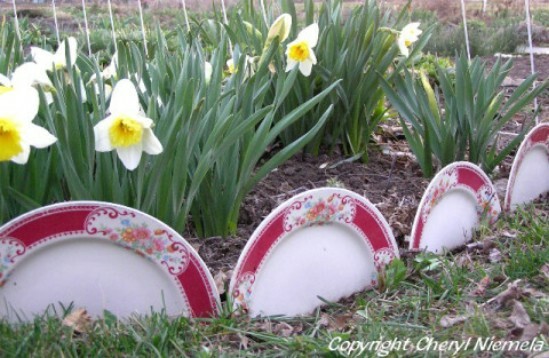 If you have a set of plates that you just can’t seem to get rid of, even though several of them are cracked or broken, you can use those plates to create a lovely fence for your garden. This is a really cheap and simple project, even if you don’t have any old plates to use. Just visit your local thrift store. If you can’t find enough plates in the same pattern, you can be a bit eclectic and mix and match your broken plate fence pattern. I love a little white picket fence! This DIY version is really easy to make and it gives off that great cottage look. Plus, it will help to protect your flowers and other plants from critters that may trample or eat them. 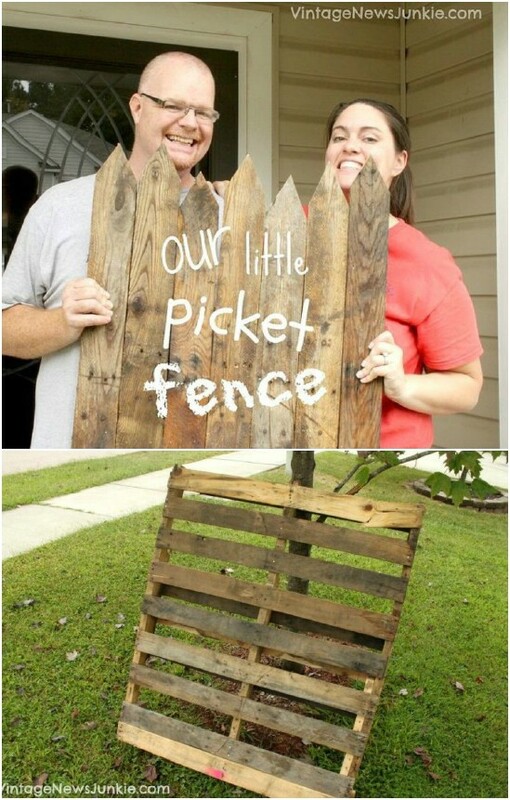 You can make your own picket fence with a couple of old pallets and then just paint it white when you get it finished. 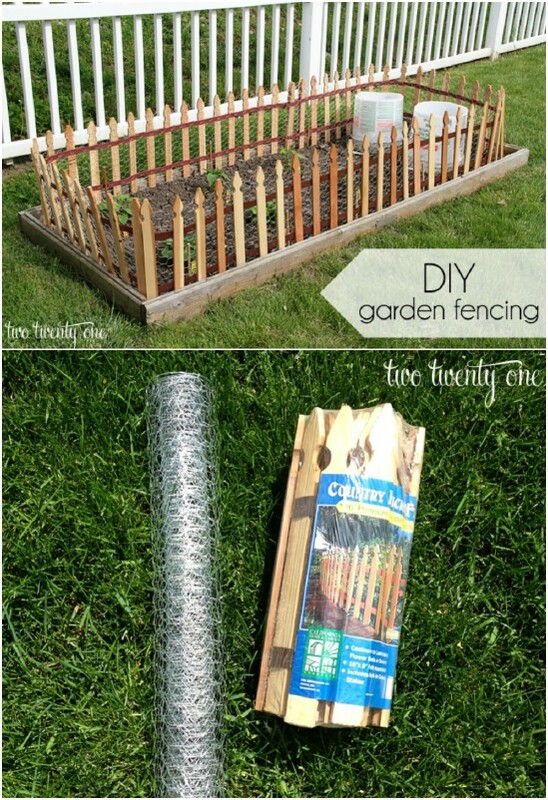 This is a really cheap and easy way to get a lovely DIY garden fence. If you are going for the rustic farmhouse look, this DIY rustic twig fence is perfect. The best part is, you make it with twigs and sticks that you find in your yard. If you can’t find enough at home, check with family and neighbors. They are sure to let you pick up sticks in their yards and once you have enough, this little garden fence is super easy to put together. Who knew there were so many home and garden projects using twigs and sticks? I love these cobblestone garden fences. Not only are they really easy to make, they look great when they are finished. You could create different beds for flowers or even have these around your vegetable garden or raised garden beds. They definitely increase your curb appeal and you can find cobblestone or landscaping bricks pretty cheap if you check with your local home improvement stores or Walmart has them on occasion, as well. 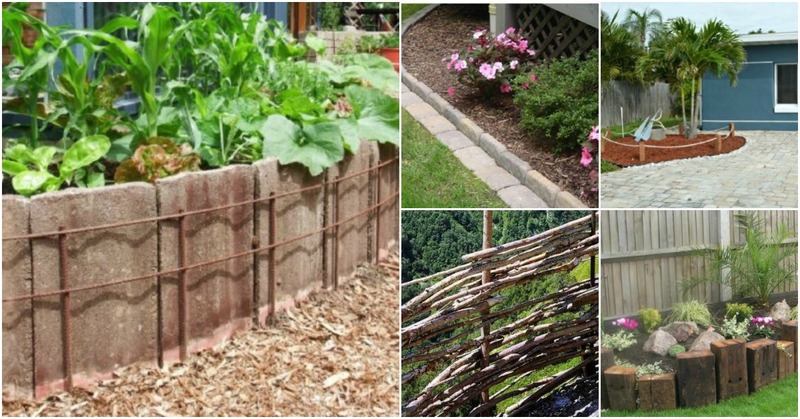 Your garden fence doesn’t have to be just functional. 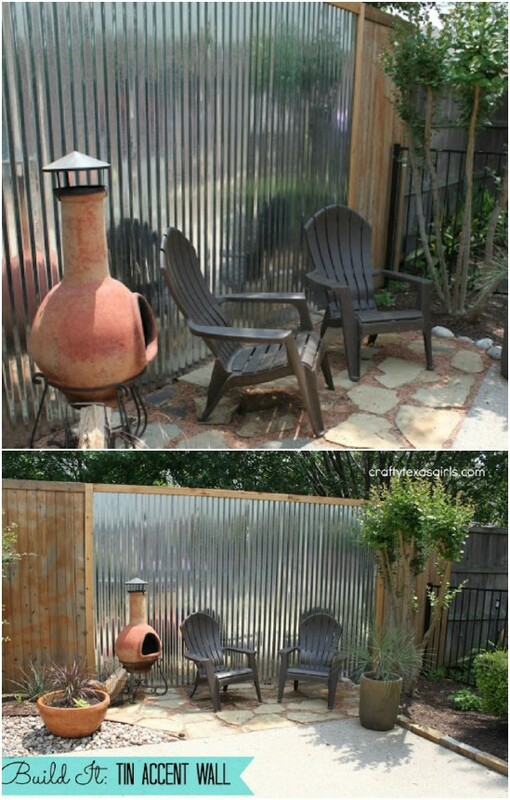 It can also be decorative, which is the case with this DIY tin accent fence. You can add this to a wooden fence and it’s a great way to showcase those favored flowers and plants. 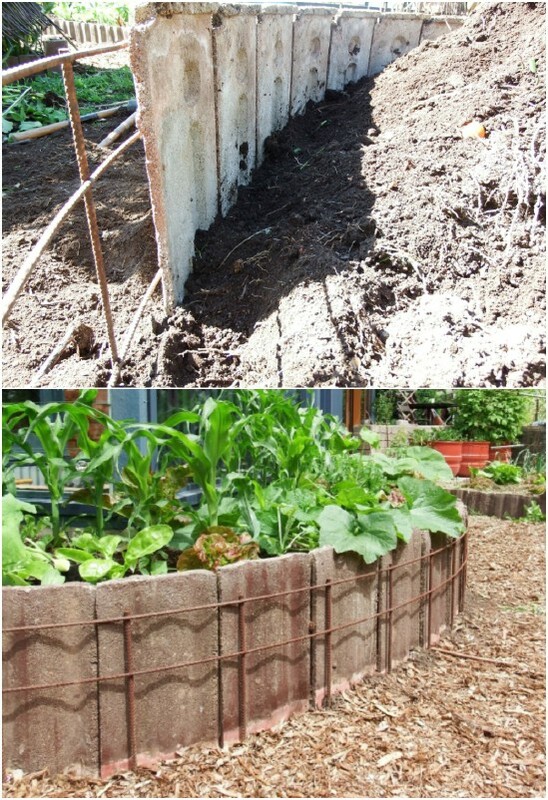 The tin is pretty tall so if you are making a shorter fence for your flower garden, just lay it sideways or cut it in half and you have enough for two accent fences. 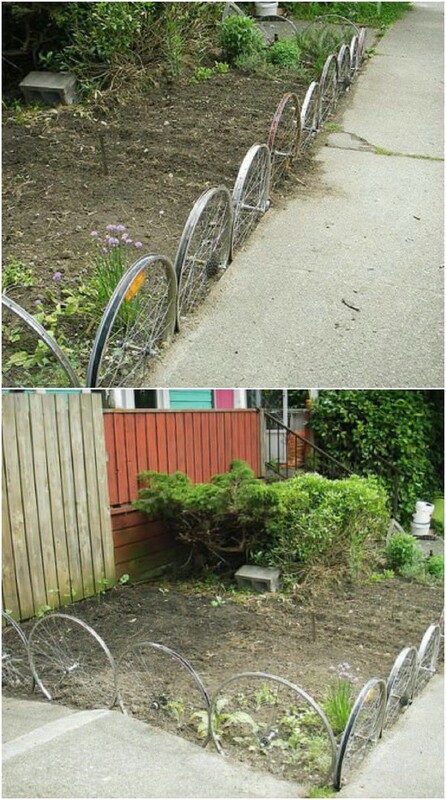 Old bike wheels are perfect for creating a nice little garden fence. You can do these as tall as you want or just use a single layer to create a short fence for a flower bed. If you don’t have a handful of old bike wheels, check your local thrift stores or flea markets. Many times, you can get an old rusted and bent bike wheel for around a dollar or so and then just line them up to create your little garden fence. 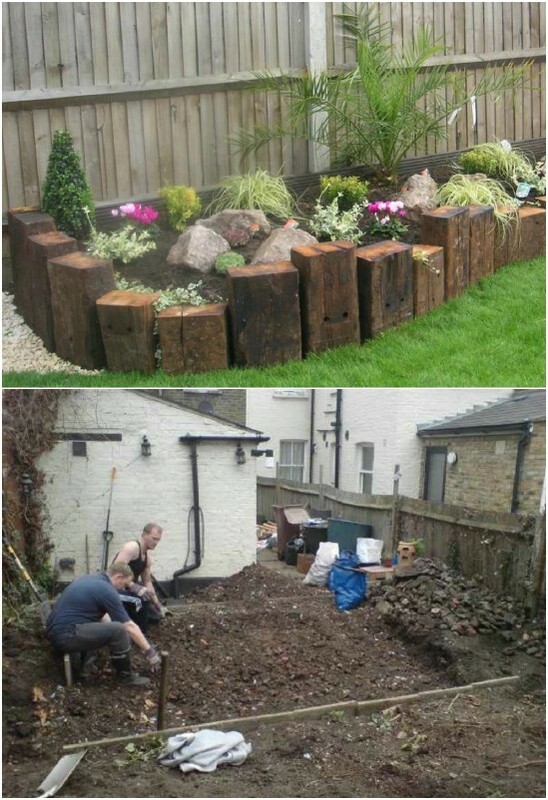 Old railway sleepers are perfect for creating a rustic garden fence for around your flowers or plants. 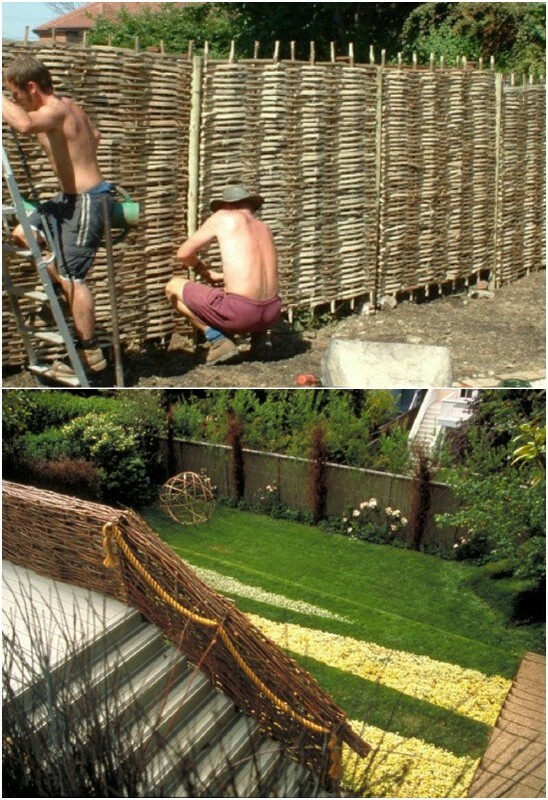 This DIY garden fence doesn’t even take that long to complete. You just choose the sizes that you want – whether you want them all the same height or you want to create a focal point by using different sizes – and then set them in the ground around your flower garden. If you want something rustic and decorative and you don’t want to spend much money, this DIY log fence is perfect. You can use logs that you may have on your property or just go out and cut a few. This is a lovely fence that really has an old world look to it and it is so simple to put up once you have your logs. This is such a charming rustic log project. 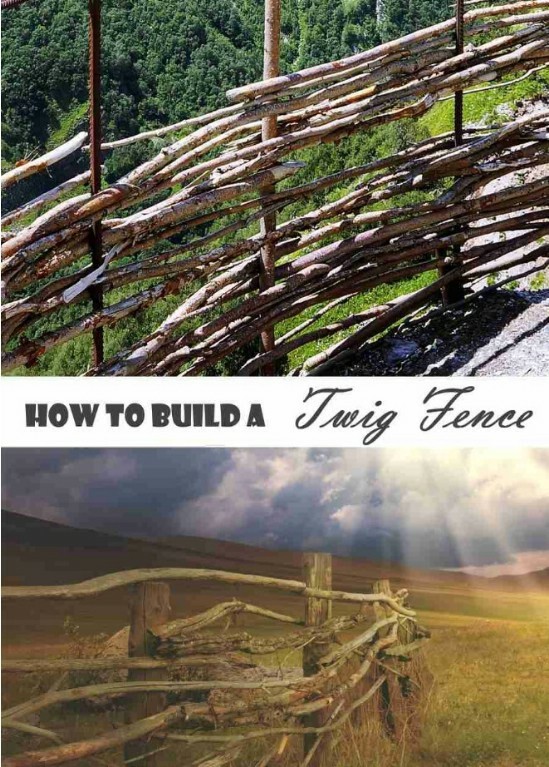 This wattle fence is really easy and cheap to make. You can make this one with sticks and twigs that you find in your yard and it is a wonderfully modern garden fence that is perfect if you are looking for a more contemporary outdoor look and feel. There are so many ways that you can make and use a wattle fence and all of them are absolutely stunning when they are finished. 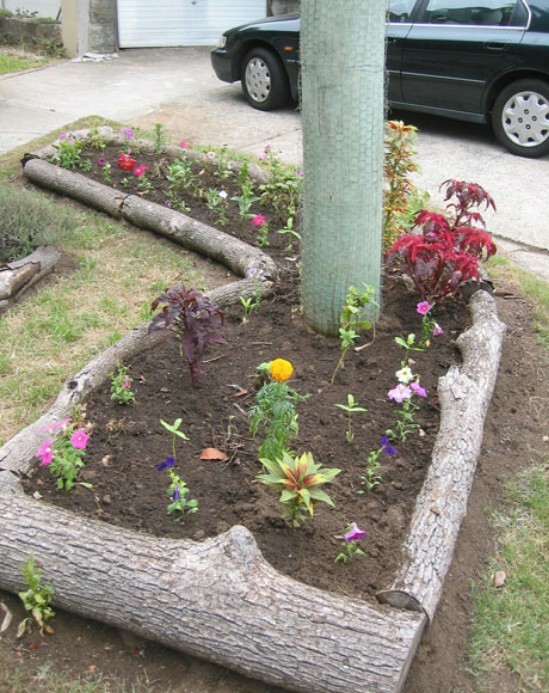 If you don’t want anything expensive or difficult, try just placing some old tree trunks around your flower garden. These have a wonderfully rustic look and feel and they are probably the simplest DIY garden fencing that you could do. You just uproot those stumps and then lay them around your garden – how easy is that? Plus, this is a great way to reuse those old tree stumps in the yard. Concrete roofing tiles can be found really cheap if you know someone who is remodeling. Those tiles can be used to create a lovely DIY garden fence that is sure to keep animals out of your garden and upgrade your curb appeal. You just add the tiles and then use soil to keep them in place – along with rebar or metal posts. 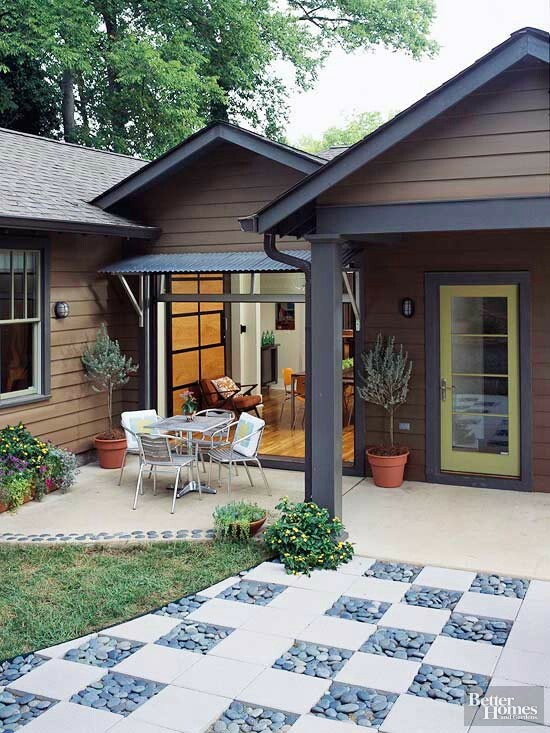 This is a great look and if you want, you can even paint the tiles to make them better match your outdoor décor. I adore this woven wattle garden fence. Not only does it do its job of keeping animals out of your garden, it has a wonderfully rustic look to it. And, it’s pretty easy to DIY. 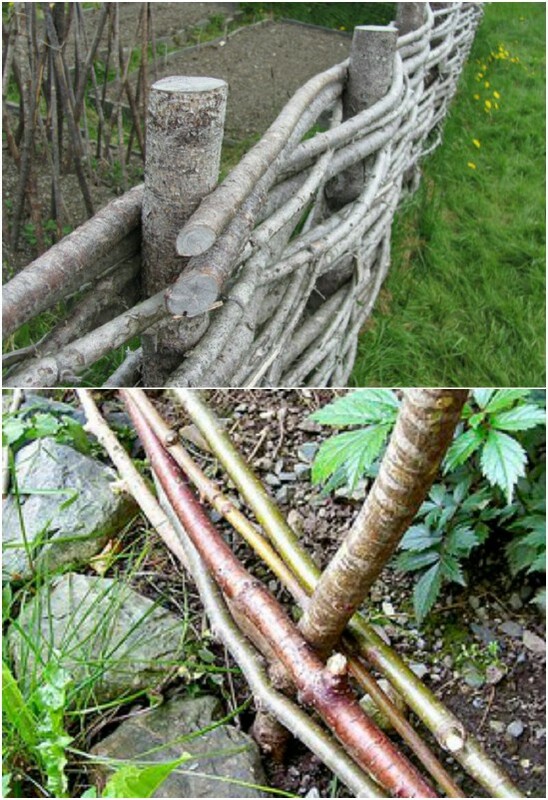 You can make this with sticks from your yard, although you will need quite a few. This is a great way to border your flower bed and give it its own unique look and if you have enough sticks on hand, this is a really cheap DIY garden fence, too. This little garden fence is made with thin wooden posts and chicken wire. It will definitely keep the critters out of the garden and it’s really easy to make. You just need a few wooden posts – thin ones – and some chicken wire to make this one. You can use reclaimed wood and if you happen to be redoing your chicken coop, you can also use reclaimed chicken wire to make this one which makes it as cheap to make as it is easy. Reclaimed wood projects are the best!